Ginger, also known as adrak, is an herb widely popular in India. It is a rhizome derived from the underground stem and is used in many Ayurvedic medicines and as spice in various cuisines. Adrak can be consumed fresh or in dried and powdered form. It can also be used in juice form or as oil. Let’s take a look at some of the health benefits of Ginger. 1. Anti-emetic action: Ginger helps in getting rid of nausea and vomiting. So, if you’re feeling nauseous, motion-sick or airsick, mix some honey and ginger and you’d be good to go. Though exact mechanism is unknown, studies have proven ginger’s efficacy in nausea and vomiting. 2. Induces appetite: If you’re having trouble with your appetite and can’t feel hungry anymore, then ginger may help you out. Simply eat a piece of chopped ginger before your meal. Ginger would boost your appetite and induce the digestive juices. 3. Improves nutrients uptake: Ginger is known to boost the essential nutrients absorption and assimilation in the gut. This effect is seen because ginger promotes gastric and pancreatic enzymes. 4. Abdominal problems: Ginger is also helpful in reducing abdominal problems like flatulence, indigestion and stomach upset. 5. Helpful in cold: Ginger is known to clear the body’s microcirculatory channels. Thus, it clears out the sinuses which usually flare up during seasonal changes or winter. You may add ginger to tea and drink for quick relief from sore throat and nasal congestion. According to University of Maryland Medical Center in adults taking 2 tbsp of freshly chopped ginger in warm water two-three times a day is helpful in treating cold and flu. 6. Aphrodisiac property: Ayurvedic text have long claimed that ginger is an excellent aphrodisiac food and boosts one’s sexual drive. 7. Relieves joint pain: Ginger ha anti-inflammatory properties, thus it can be helpful in joint pain. You may add some ginger oil in the bath to find relief from the joint and muscle aches. 8. Improves Blood Circulation: Ginger has minerals like zinc, magnesium and chromium that help in improving blood flow. 9. Prevents stroke: Consuming small amounts of ginger regularly can reduce the risk of stroke by inhibiting the fatty deposits from arteries. 10. Anti-inflammatory and analgesic: Ginger is rich in substances which have effective anti-inflammatory action and acts as potent natural painkiller. 11. Effective in Respiratory Problems. Ginger is a natural expectorant. It helps in breaking down and removing mucus from respiratory system. Thus it is helpful in respiratory problems like cough and aids in recovering from breathing problems quickly. 12. Boosts Immunity. Ginger aids in improving body’s immune system. It decreases the risk of abdominal bacterial infections, and also fights throat infection and cough. 13. 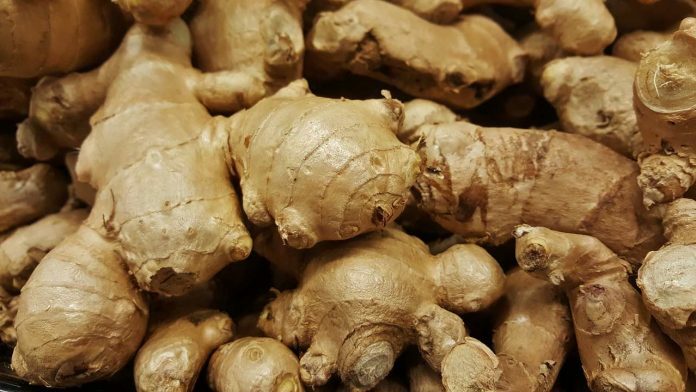 Prevents Colon Cancer: According to a study conducted by University of Minnesota ginger might be effective in slowing the growth of cells in colorectal cancer. 14. Ovarian Cancer Treatment. Ginger powder has shown to promote cellular death in ovarian cancer cells, thereby assisting in its treatment.